The original attitude of the American Indian toward the Eternal, the "Great Mystery" that surrounds and embraces us, was as simple as it was exalted. To him it was the supreme conception, bringing with it the fullest measure of joy and satisfaction possible in this life refer to Great Spirit. The worship of the "Great Mystery" was silent, solitary, free from all self-seeking. It was silent, because all speech is of necessity feeble and imperfect; therefore the souls of my ancestors ascended to God in wordless adoration. It was solitary, because they believed that He is nearer to us in solitude, and there were no priests authorized to come between a man and his Maker. None might exhort or confess or in any way meddle with the religious experience of another. Among us all men were created sons of God and stood erect, as conscious of their divinity. Our faith might not be formulated in creeds, nor forced upon any who were unwilling to receive it; hence there was no preaching nor persecution, neither were there any scoffers or atheists. There were no temples or shrines save those of nature. 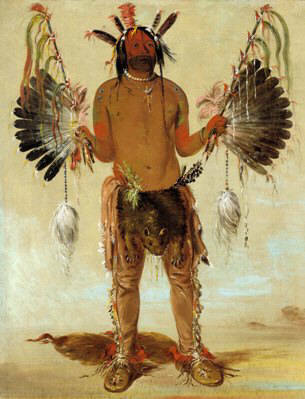 Being a natural man, the Indian was intensely poetical. He would deem it sacrilege to build a house for Him who may be met face to face in the mysterious, shadowy aisles of the primeval forest, or on the sunlit bosom of virgin prairies, upon dizzy spires and pinnacles of naked rock, and yonder in the jeweled vault of the night sky! He who enrobes Himself in filmy veils of cloud, there on the rim of the visible world where our Great-Grandfather Sun kindles his evening camp-fire, He who rides upon the rigorous wind of the north, or breathes forth His spirit upon aromatic southern airs, whose war-canoe is launched upon majestic rivers and inland seas—He needs no lesser cathedral! The solitary communion with the Unseen which was the highest expression of our religious life is partly described in the word bambeday, literally "mysterious feeling," which has been variously translated "fasting" and "dreaming." It may better be interpreted as "consciousness of the divine." The first religious retreat, marked an epoch in the life of the youth, which may be compared to that of confirmation or conversion in Christian experience. Having first prepared himself by means of the purifying vapor-bath, and cast off as far as possible all human or fleshly influences, the young man sought out the noblest height, the most commanding summit in all the surrounding region. Knowing that God sets no value upon material things, he took with him no offerings or sacrifices other than symbolic objects, such as paints and tobacco. Wishing to appear before Him in all humility, he wore no clothing save his moccasins and breech-clout. At the solemn hour of sunrise or sunset he took up his position, overlooking the glories of earth and facing the "Great Mystery," and there he remained, naked, erect, silent, and motionless, exposed to the elements and forces of His arming, for a night and a day to two days and nights, but rarely longer. Sometimes he would chant a hymn without words, or offer the ceremonial "filled pipe." In this holy trance or ecstasy the Indian mystic found his highest happiness and the motive power of his existence. The Native American divided mind into two parts,—the spiritual mind and the physical mind. The first is pure spirit, concerned only with the essence of things, and it was this he sought to strengthen by spiritual prayer, during which the body is subdued by fasting and hardship. In this type of prayer there was no beseeching of favor or help. All matters of personal or selfish concern, as success in hunting or warfare, relief from sickness, or the sparing of a beloved life, were definitely relegated to the plane of the lower or material mind, and all ceremonies, charms, or incantations designed to secure a benefit or to avert a danger, were recognized as emanating from the physical self. The elements and majestic forces in nature, Lightning, Wind, Water, Fire, and Frost, were regarded with awe as spiritual powers, but always secondary and intermediate in character. The spirit pervades all creation and that every creature possesses a soul in some degree, though not necessarily a soul conscious of itself. The tree, the waterfall, the grizzly bear, each is an embodied Force, and as such an object of reverence and while he humbly accepted the supposedly voluntary sacrifice of their bodies to preserve his own, he paid homage to their spirits in prescribed prayers and offerings. In every religion there is an element of the supernatural, varying with the influence of pure reason over its devotees. The Indian was a logical and clear thinker upon matters within the scope of his understanding, but he had not yet charted the vast field of nature or expressed her wonders in terms of science. With his limited knowledge of cause and effect, he saw miracles on every hand,—the miracle of life in seed and egg, the miracle of death in lightning flash. The supreme mystery that is the essence of worship, without which there can be no religion, and in the presence of this mystery our attitude cannot be very unlike that of the natural philosopher, who beholds with awe the Divine in all creation.